When Jesus was twelve years old, they going up into Jerusalem, according to the custom of the feast, and having fulfilled the days, when they returned, the child Jesus remained in Jerusalem; and His parents knew it not. And thinking that He was in the company, they came a day’s journey, and sought Him among their kinfolks and acquaintance. And not finding Him, they returned into Jerusalem, seeking Him. And it came to pass that after three days, they found Him in the temple, sitting in the midst of the doctors, hearing them, and asking them questions. And all that heard Him were astonished at His wisdom and His answers. And seeing Him, they wondered. Christ Among the Doctors, by Pinturicchio (Bernardino di Betto), in the Baglioni Chapel of St Mary Major in Spello, Italy; 1501. 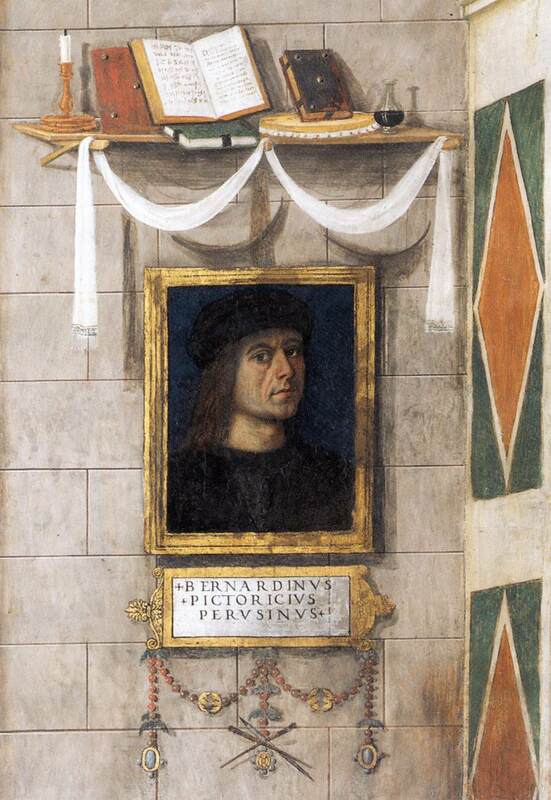 In the same chapel, the painter Bernardino di Betto signed his work by including this portrait of himself. He is often referred to as “Pinturicchio”, which means “tiny little painter”, because he was remarkably short. He originally trained as a miniaturist and illustrator of devotion manuals, often working on hand-sized pages under magnifying glasses, and using brushes with a single hair to create incredibly fine details. 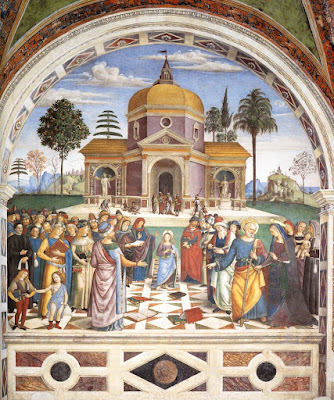 The same level of detail appears in his fresco works; note the elaborately painted trees and tiny buildings in the background of Christ Among the Doctors above, or the string of beads hanging from his signature plate below, to which are attached two paint-brushes and a scalpel.